Always ahead of the curve, IKEA once again displays their creative might with a 200 square meter temporary lounge at the Charles de Gaulle Airport in France. Passengers departing from Terminal 3 can take a snooze in one of nine cozy beds or simply relax on the sofa while waiting for their flight. And what will this goodness set you back? Not a single penny. Temporary shops and restaurants are becoming an increasingly popular method for companies to advertise their brand or expand their reach. But this is the first time, at least that we know of, that a company has installed a pop-up lounge in an airport. 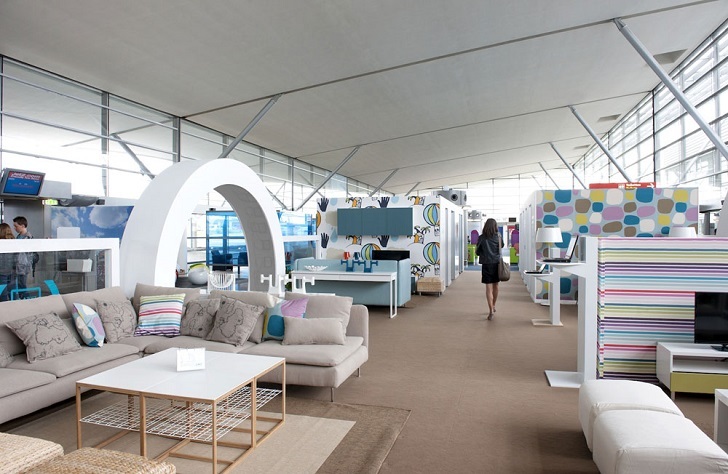 Thousands of people traverse the Charles de Gaulle airport every day, so IKEA completely maximizes brand exposure for the month that airport’s temporary mini-home is furnished with their products. Plus, they’ve ensured that the lounge is both child and adult friendly. A team of exports are on hand to supervise children in a 50 square meter play area, which could potentially allow parents to take a short snooze. The lounge will be available to the public until 5 August, 2012.